Our bags are carefully designed with a unique blend of craftsmanship, superior quality control, and design. With the amount of plastic waste that ends up on the earth's landfills, waterways, parks, beaches, and oceans, it makes total sense to collect, recycle and repurpose these plastics into another useful product that will help drive the future of sustainable living. 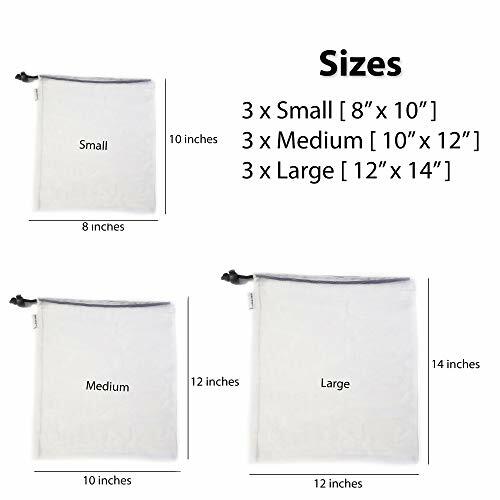 Enjoy the ease of cleaning and organization with these bags with how much lighter they are than competitor bags. Most competitor bags weigh 0.5 ounces or more on their smallest size while ours weigh just 0.32 ounces. These bags are so light they feel like feathers and will easily fold to fit in your pockets for transport. But don't be fooled by their weight, these bags carry their own weight. The seams are double-stitched all around bringing the carrying capacity up to 20 pounds. You will not find this weight limit on any other bag period. 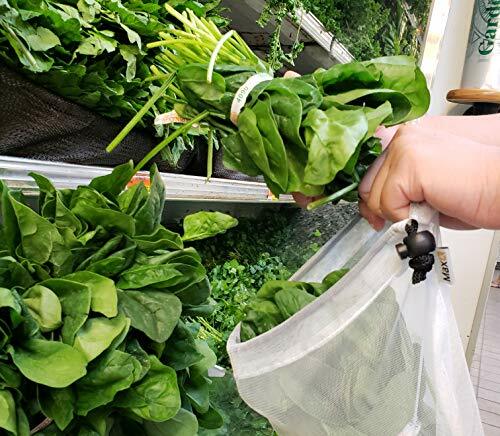 These bags are not just for the kitchen, harvesting in your garden never got easier or washing delicates. One customer reported using these bags as a chum bag while they were offshore fishing! Imagine that. The options are truly endless, use your imagination! All Max K products come with a lifetime warranty that protects our customers purchases. 100% customer satisfaction is guaranteed or we will refund your money, no questions asked. Great product, good communication, and fast shipping. Thank you. Good quality reusable bags. Because they come in a pack of 9 in a variety of sizes, one purchase covered multiple needs. I can feel good about reusing them over and over because they are made of recycled material that is durable. These are a great option if you or someone you know is going minimal or eco-friendly. I'm in love with these bags. At first I was like "wow, 9 bags why do I need that many" but I may just order more. I use these at the grocery store, to store things in my kitchen, and In my diaper bag. Truely a great all purpose bag. I got thee with the intention of storing fruit and veggies but they are also great for small laundry items - like children’s socks. Great addition to my laundry room and kitchen. Plastic bags now cost $0.10 where I live, so I've switched over to cloth bags whenever I go grocery shopping. i've been feeling guilty above my use of plastic bags for produce, though - i don't want to have it loose in my bags, but also didn't want to use more plastic. These were a great solution. I appreciate that they come in different sizes and are see through. Nice packaging and a good quality product for the price. Great for storing fruits and vegetables, keeps them fresh longer. 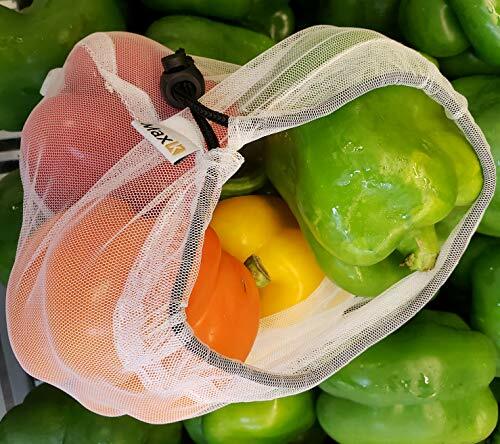 These mesh bags are perfect for storing produce. I hang them inside my pantry, where it is dark and cool. The set has a really nice assortment of sizes. I like the size of the mesh too, as I can store my onions without the skins falling out. Easy to clean by machine or hand washing. My sister is very much into zero waste. I got these for her for Christmas to help her stay waste free. I need to get some for myself as well! Multipurpose use. So I am using a couple of these reusable bags for fruits and vegatables in the fridge but have also put the others to great use as well. I use one bag for my delicates so that they dont get mutilated by the washing machine spinner. I also judt used a couple on a broef vacation to help organize my clothing articles such as socks and underwear. I used one for dirty items to help keep them seperate as I went along. Very happy with my purchase! These bags are great for fruits and vegetables. They are so versatile in that you could use them for anything else too. I like that air can easily get into the bag so the fruits and vegetables can breath easily. Bags are easy to clean too. Highly recommend! 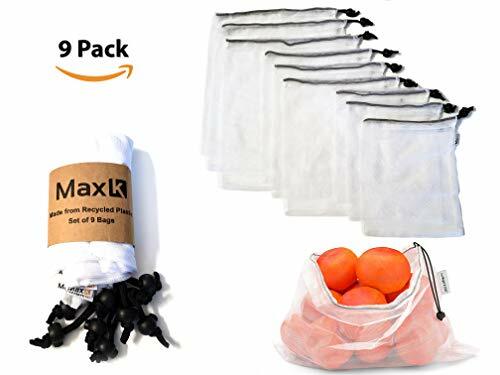 It is a small thing to do that can make a big difference, I would highly recommend these to anyone instead of using plastic bags. They are very affordable. Very happy. Quality. Reusable. Easy to clean. I leave a few in my cotton grocery bags in my car so I never have to use the plastic bags to but my produce. Now I can avoid taking all the plastic bags I do while shopping for grocery. Also, these bags seem highly durable, and they are also easy to reuse. These bags seem to work well and as advertised. I couldn't tell if it kept our produce good for longer, but it got the job done. These bags did clean very well though, which I appreciated. I do wish that the largest bag was just a little bit longer, that way it could fit smaller zucchini or cucumbers. You can use these for a lot of other stuff, not just produce. And its durable, very nice! I love these bags. They are made from recycled plastic which makes them environmentally better than single use plastic bags. Beats using plastic bags in the fridge for produce. Keeps veggies fresh longer. The strings are heavy duty. Good value for money. 9 packs of different sizes and can be used for varies purposes. Eco-friendly and made from recyclable plastic. The buttons are very smooth. All in all a good product to use. Great bag for storing vegetables and fruits i love it. I bought these to use to store sets of small toys and homeschool supplies (blocks, Little People, math manipulatives, etc) that tend to get separated, lost, and unorganized. I love that you can see through the bags and know exactly what is in each one without having to open them and look inside. These seem to me well-made bags from good quality material, and I look forward to using them for years to come! I actually purchased these for drying produce from my garden. They are nicely heavy duty! The stitching all seems to be high quality and sturdy. I've filled them up and hung them from hooks using the drawstrings, and they are holding up well. They are holding popcorn kernels and Hopi and cranberry beans, which are all fairly heavy. 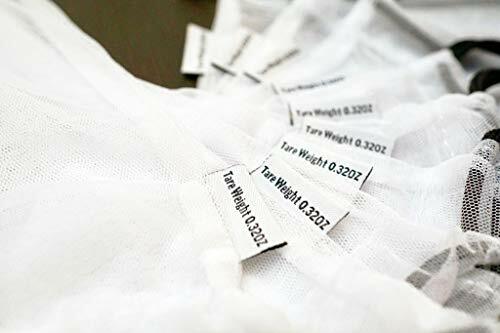 I love that each bag is labeled with the tare weight to make using them at the store easier! I'm planning on purchasing more, not just for the garden, but for their intended use as well. I think they'll hold up quite well. I am very excited to start bringing bags to the grocery store so I don't have more plastic laying around the house. The bags are of good quality and breath well. They close easily and hold strong. Overall a great idea for our environment and great product. Also love that they can be thrown in the wash. I am so guilty that everytime I shop I always end up with a lot of plastic bags. I am happy I can help mother earth by using this instead of plastic bags. Not only that, it helps my produce to last longer because of its breathable high quality material. This is also washable and comes in different sizes according to our needs. I love this product! 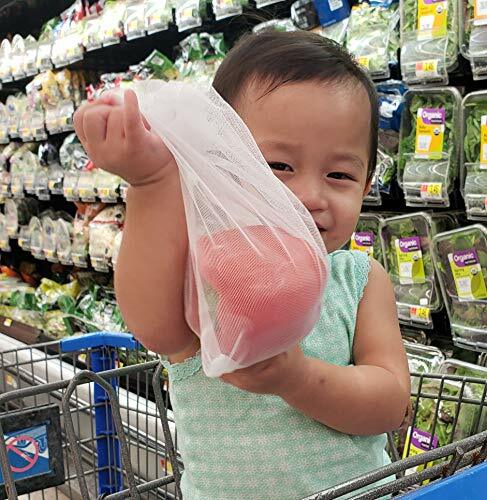 My family and I are able to reduce the amount of plastic bags we bring home after shopping for produce. The item is very sturdy and well made so you won't have to worry about rips and tears. Best thing of all is that the item can be used continuously and you won't have to worry about recycling plastic bags. I am extremely happy I went with such a simple product. This is just a small measure we can take when it comes to reducing use of plastics and wasting materials. There are enough bags to fit my shopping needs in the produce section and I can feel safe about knowing what my food is stored in vs worry that plastics are suffocating my food while stored in the refrigerator. I feel like everyone should make the switch. 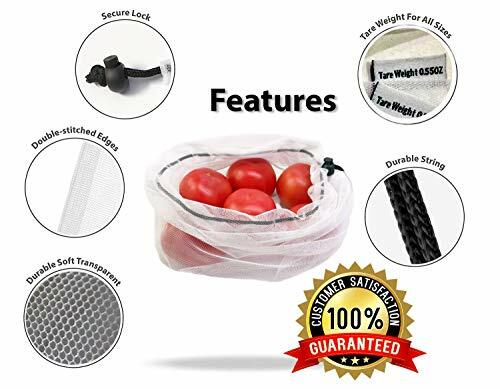 This is a great addition to my kitchen given that it is eco-friendly, super versatile, and has been great at keeping my produce in good shape. I am used to using plastic bags that would make my produce get moldy fast or would result in an all around less appealing result. But with these bags I am able to upgrade that aspect therefore upgrading my life. For a very low cost you can help reduce plastic waste soooo much. I love everything about this product. I will be using them every time I go to the market.